RPSC LDC Recruitment 2019: Rajasthan Public Service Commission (RPSC) is expected to reveal Lower Division Clerk Government Recruitment notification in coming months. As per the officials, vacant positions will be filled on regular basis. Candidates who are eligible for RPSC Lower Division Clerk Recruitment 2019 drive, they can apply for the same in the due course of time. Application forms for Rajasthan Lipik Grade II will be filled from the official website of RPSC. 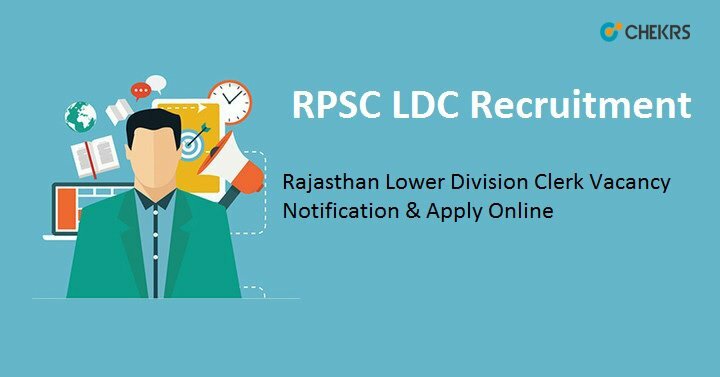 More details on Rajasthan RPSC LDC Recruitment 2019 such as eligibility criteria, selection process, application fee are covered in below section. Latest Update: The RPSC will going to publish the LDC Recruitment. Interested & Eligible candidates can check all the details from here. The Rajasthan Public Service Commission will be released the LDC Recruitment 2019 Notification on the official website to fill up the various vacant posts. (राजस्थान अवर श्रेणी लिपिक भर्ती): Candidates who are eligible for the Rajasthan Public Service Commission Recruitment, they can from the official portal, in order to register themselves for RPSC Lipik Bharti 2019, they have to visit the official website which is mentioned in the below section. The application forms are only collected within the stipulated time as specified in the official notification. Further details on RPSC LDC Vacancy 2019 such as the total number of vacancies, last date to apply are specified in the below table. Candidates appointment for Lipik Grade will be done on the basis for certain rounds of selection. Candidates who have applied for the Rajasthan Lower Division Clerk Recruitment 2019, they have to appear in further rounds of selection. In order to select the suitable candidates, the exam conducting authority will conduct a written test followed by Hindi and English typing test. Instructions regarding RPSC LDC Apply Online 2019 are covered in the below sections. In order to hire a suitable candidate, the recruitment authority has set certain eligibility conditions, and on the eligibility criteria as well as performance in the selection rounds candidates will be finalized. Candidate must be 12th class passed from a recognized/ equivalent board. Should possess Higher Level Certificate Course conducted by DOEACC under control of the Department of Electronics and GOV of India. Computer operator & Programming Assistant (COPA)/Data Preparation and Computer Software (DPCS) certificate organized under National/ State Council of Vocational Training Scheme. Note: Preference would be given to those candidates who have the working knowledge of Hindi in Devnagri Script and Knowledge of Rajasthan Culture. Candidate age must be between 18 years to 35 years. The age Relaxation for reserved category candidates will be based on RPSC rules or Norms. The selected candidate will be offered Rs 5200-20200, however later on as per grade pay Rs 2400/- would be paid additionally. Applications for Rajasthan Lipik Garde will be only collected online. However, for the convenience of applicants, the procedure for online registration, user manual to guide are available on the official website. Visit the official website of RPSC. Click on “RPSC LDC 2019 Application Form apply link. Now application form will appear on the screen. Enter all the required details such as basic details, qualifications etc. Upload scanned the photograph and scanned signature. Now cross check the filled application form, make payment and. Take a printout of the same for further reference. Candidates will be selected for the LDC position on a basis of two Phases evaluation process. Candidates who applied for the recruitment drive they will be called for a written test, followed by consecutive rounds of Hindi and English typing test. Note: The one-time registration process has not begun yet, but it is likely to in a couple of days, in order to get more details on RPSC LDC Recruitment 2019, keep this visiting this page.